Arti Paintbar is a painting studio that is open to everyone with or without any background in painting. We believe painting is a fun way to spend time with other people while also being able to relax and unwind. We are an open studio, meaning everyone is welcome to pop in anytime to paint. We hold painting guided classes where the instructor leads a class step-by-step into creating a beautiful artwork and also collaborate with talented artists and hold workshops in our space. Private events are also available upon request. Here, everything you need will be provided, including one blank canvas, unlimited paint, painting supplies and one free drink of your choice. All you have to bring is your painting spirit and creative mind! Paint, relax, and have a great time. Come and paint anything you want! 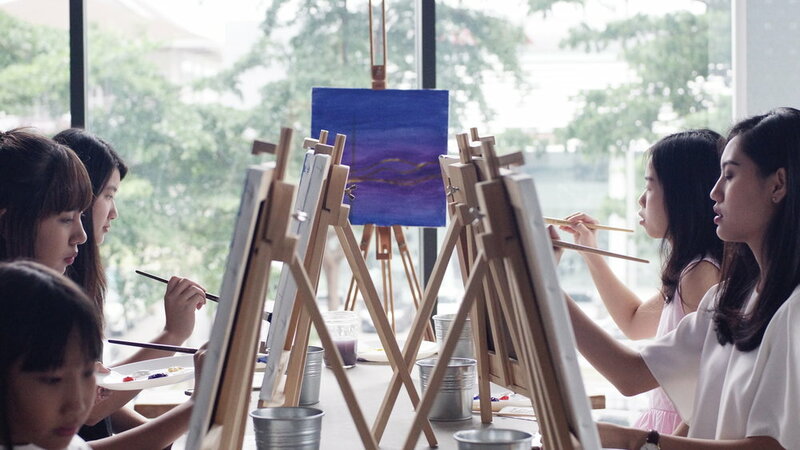 Express yourself on the canvas and make your own creation or choose from our selection of self-guided paintings. Painting instructors are available upon request. Spend time with other people while you create your very own painting! Let our instructors guide you in a class setting step-by-step until your artwork is done. It's always better with friends and family! Sign up for a workshop! Let yourself explore the inner artist in you and try out other forms of art! We love collaborating with talented artists to share their skills to you! Plan a painting session that suits your group. You can celebrate your birthday, anniversary, corporate event, or anything you can think of! You can celebrate at our studio or we can come to you!